Haji Siddique Foundry is one of the oldest and the largest foundries in U. A. E., where all types of Ferrous and Non –ferrous materials including Alloy Steels, Alloy Cast Irons, Copper Alloys and most Aluminium Alloys are successfully cast as per customer’s specifications. 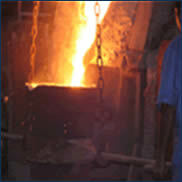 The foundry is equipped with an induction furnace besides 2 rotary furnaces and conventional crucible furnaces. - High Strength / Hardened / Temperature Resistant Steels. - Wear and Impact Resistant Steels. - Corrosion and Temperature Resistant Stainless Steels. - Wear / Abrasion Resistant Iron. The maximum weight for any single piece, that can be cast in our foundry is 2000 Kg. A full fledged pattern shop works in close conjunction with the foundry to achieve the best ossible casting of parts, with close tolerances and strict adherence to the specified sizes. Our experienced pattern makers are quite capable to make patterns, in wood as well as aluminium, for the most intricate castings in the shortest possible time. polished and lacquered for weather protection.